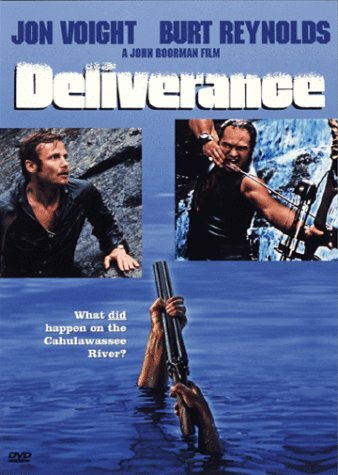 Everybody know Dueling Banjos and Ned Beatty squealing like a pig, but have you seen the movie? An amazing story about civilized men being torn apart by nature until they become savages. A story about manhood. A thriller that's all about character... and just how far a man can go. You will never see another movie like this - the four stars did all of their own stunts. That's really them in those canoes being slammed against rocks by the rapids. No studio would ever allow stars to risk their lives like that today! The DVD has a great behind the scenes feature where you see just how close to death these actors got while making this movie. Scenes from this film are branded into my brain - I can't help but think of them late at night. When Jon Voight climbs that cliff, pulls out the picture of his family to give him the strength to continue... and drops it hundreds of feet into the river! Your heart stops beating. BUY THIS DVD! Back when James Bond was the hottest thing on the big screen, one of the Bond producers bought the rights to a series of novels by Len Deighton about a very different kind of spy. Harry Palmer wears glasses, gets chewed out by his boss, and can't stand the mound of paperwork involved in the spy business. There's a report to fill out on everything! Palmer is the anti-Bond: a normal guy spy who cuts through the red tape on a mission to discover why top British scientists are disappearing. The dialogue is great, there are a zillion plot twists, and director Sidney J. Furie finds the strangest camera angles in the history of cinema (a fight scene is shot through the door of a phone booth). Did I mention the haunting John Barry score? You'll be humming it for weeks! BUY THIS DVD! There's a script tip in the rotation about this movie, and I often use it as an example when I'm teaching. Half rom-com, half sci-fi, HAPPY ACCIDENTS is the story of a woman who is unlucky at love (Marisa Tomei) who finally meets the perfect guy (Vincent D'Onofrio)... There's only one problem - he claims to be a time traveller from the future who is here on a top secret mission. Should she stick with him because he's the nicest guy she's ever met? Or run like hell because he's stark raving mad? This movie will keep you guessing until the end! BUY THIS DVD!